MIAMI | One vocation has him tending to the physically sick; his other vocation has him tending to the spiritually ill. But when it comes to working with the homeless and poor in Miami and elsewhere, it usually involves both body and soul for Father Scott Francis Binet, MD. Father Scott Francis Binet is a consecrated religious in perpetual vows with the Order of St. Camillus and a diplomate of the American Board of Family Medicine. He ministers at the Miami Rescue Mission, goes on foreign mission trips and served as founding president of the Miami guild of the Catholic Medical Association. A consecrated religious in perpetual vows with the Order of St. Camillus and a diplomate of the American Board of Family Medicine, Father Binet oversees a unique ministry that takes him primarily throughout Florida, South Carolina and Georgia as well as on foreign mission trips — including a recent medical mission with indigenous populations in Central America. He also has practiced medicine and served as a missionary priest in countries such as Indonesia, Haiti, Sudan — and even downtown Miami. “I have a Florida medical license and I was looking for a place to do volunteer work here, so some of my friends at Miami’s Camillus House recommended the Miami Rescue Mission clinic, so I continue to serve there,” the priest said. At the Miami Rescue Mission, Father Binet said he sees mostly with men who are suffering significantly either from mental illness or secondary drug abuse problems that render them homeless and unable to maintain family lives and employment. “Miami is a beautiful place and they can stay outside for a while but some of them seek help, and when they do the Miami Rescue Mission and other places provide a respite,” he said. The Rescue Mission provides a faith-based clinic called The Caring Place. Father Binet received a Bachelor of Science degree in biology from Christian Brothers University in Memphis, Tennessee and earned a Doctor of Medicine at the University of Arkansas for Medical Sciences. He completed a family practice residency at St. Joseph’s Hospital in Yonkers, New York. In terms of his religious studies, he holds master’s degrees in bioethics and Sacred Scripture, and a degree theology. He is also founding president of the Miami Guild of the Catholic Medical Association and currently a regional co-director for the CMA’s Regions III and V.
Father Binet spoke with the Florida Catholicwhile volunteering as an on-site physician at the spring meeting of the U.S. bishops, held in June in Fort Lauderdale. At least 20 Catholic medical professionals in the Miami region are regular attendees to CMA functions; statewide there are seven guilds with an eighth in formation, for a total of about 100 active members in Florida, said Father Binet, who is based in South Carolina but maintains a relationship with CMA groups in Florida. 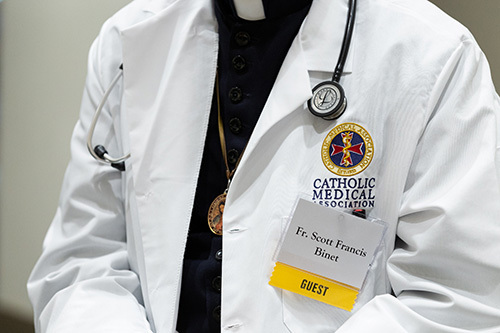 “We want to live the science and art of medicine, upholding the principles of the Catholic faith, and that can express itself in many ways, so there is the opportunity with CMA to have fellowship and support, encouragement from other healthcare providers and physicians,” Father Binet said. CMA also helps members delve into the academic and scientific aspects of medicine — the “art of medicine” and how Catholic healthcare providers deal with the human beings in patient care. “These days that involves a lot of bioethics and moral issues. A strong part of our experiences is being up to date on what the Church teaches about these important issues, and to be prepared to address them and to educate others. And then we are interested in being out in the community, witnessing and volunteering so that we can impact the community through events and advocacy at the level of the legislature,” he said. CMA members often speak on panels or go before committees to discuss topics like abortion or end-of-life issues. 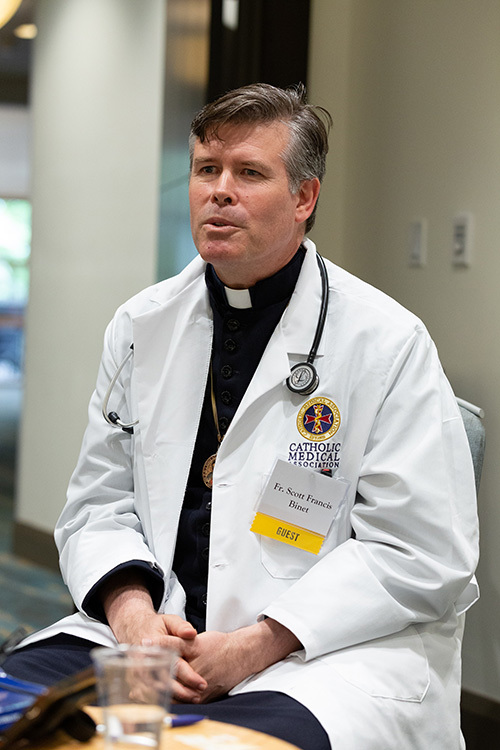 Father Scott Francis Binet was in Fort Lauderdale in June as one of two on-site physicians at the spring meeting of the U.S. bishops. There is always room for more Catholic physicians, nurses, dentists, and other medical professionals in the CMA, and there is a relatively new thrust to recruit Spanish-speaking and Hispanic members in keeping with the general population trends nationwide, the priest said. Members usually attend a local “White Mass” with their bishop and are invited to participate in periodic overseas medical mission trips. Most recently, Father Binet had accompanied a delegation of medical and dental professionals from the Diocese of Charleston to work at a clinic in Guatemala for a week. It turns out he was leaving as a historic tragedy was unfolding there. “We left 20 minutes before the volcano erupted,” he said. He was accepted as a seminarian in Little Rock, Arkansas before doing residency in New York, but instead he lived at the minor seminary in the Archdiocese of New York and studied theology and philosophy at St. John’s University. He considered entering the major seminary in the New York Archdiocese but ultimately decided on yet another path. In 1996, he learned about and joined the Order of St. Camillus, which is dedicated to ministering to the poor and sick. Some 25 of its 1,200 members worldwide have medical degrees. For more information about the Catholic Medical Association see https://www.cathmed.org.